Jyotirlingas, known as “the Radiant light of the Almighty” are sacred pilgrimage sites for the believers of Lord Shiva. According to legends there are originally 64 Jyotirlingas in total, but only 12 of them are considered holy. Each Hindu devotee wishes to visit all the Jyotirlingas to get the blessings of the Lord. IndiaPilgrimTours offers you a chance to visit 7 of the Jyotirlingas with our specially-crafted 9-day itinerary. Embark on the journey for spiritual awakening through the pilgrimage package. The divine sites offer bliss like no other. Peruse the details for complete information. The holy seven Jyotirlinga Darshan tour begins with your arrival in Jamnagar. From the airport/ railway station start your journey towards Dwarka by road. One of the revered Char Dham destination, Dwarka is also one of the seven ancient holy places in India according to Hinduism. Upon arrival, check-in at the hotel. Freshen up and stretch your legs and in the afternoon, leave for sightseeing. 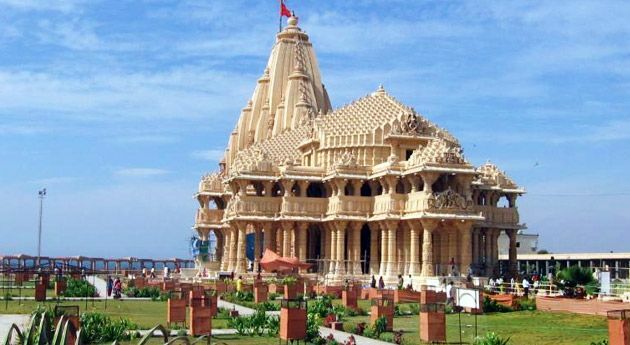 Explore the sights of the holy town and later proceed to the famous Dwarkadhish Temple. Almost 1400 years old, the divine temple worships Lord Krishna. Proceed for a temple darshan, followed by attending the glorious aarti. With blessings of the lord, return for overnight stay at hotel. Today you will have an early start. First visit the Bhet Dwarka or Beyt Dwarka, an island offshore Dwarka said to be one of the holy sites in India. Later, proceed to the 19th century Nageshwar Jyotirlinga temple. The divine temple dedicated to Lord Shiva and houses one of the revered 12 Jyotirlingas. Here attend the holy abhishekam ceremony of the Nageshwar Jyotirlinga. Next, proceed for a visit to Rukmani temple. After the blessings of the divine, relish a delightful breakfast. Later, begin your journey to Somnath by road. Upon arriving, check-in at the pre-booked hotel. Rest for a while, after which proceed for a visit to the Somnath Jyotirlinga temple. Among the revered 12 Jyotirlingas of Lord Shiva, this temple stand out owing to its magnificent architecture and the equally impressive history behind it. Complete your darshan of the temple. Also, attend the evening aarti to bask in the spiritual bliss. Have your dinner and return to hotel for overnight stay. Start the day with a hearty breakfast. Later, pack your bags and checkout from hotel. Proceed to Rajkot by road. On arriving, get assistance to the airport to board your flight to Mumbai. Upon arrival at the Mumbai airport, avail transfer to hotel for overnight stay. After breakfast at the hotel, drive to Bhimashankar, which is located at a distance of around 220km from Mumbai. On arriving at Bhimashankar, complete your check-in formalities at the hotel. Housing one of the 12 Jyotirlingas in India, here you can visit the Bhimashankar Temple and seek the blessings of Lord Shiva. Set amid lush greenery, the beauty of the temple is all the more surreal. Later in the evening, you can opt to pay a visit to the Bhimashankar Wildlife Sanctuary. Return to the hotel for dinner followed by an overnight stay. Start the day early in the morning with a delicious platter of breakfast. Later, make your way to Shirdi, almost 183km away. The small town in Maharashtra is among the holy pilgrimage destinations in India. It is known for being the home of the divine saint, Sai Baba. Visited by pilgrims of all faiths, it is one of the holiest pilgrimage sites for people all around the world. On arriving in Shirdi, pay a visit to Samadhi Mandir, Khandoba Temple and Shri Sai Baba Sansthan Complex. Get blessings of Sai Baba. Later, proceed for a visit to Shani Shingnapur, at a distance of 65km from Shirdi. This holy town is known as the home of Lord Shaneshwara, worshipped as the personification of Lord Saturn. Visit the temple and pay your respects. Later in the evening, proceed to drive to Aurangabad. On arrival, check in at the hotel for overnight stay. Begin the day with a visit to Grishneshwar Temple. One of the 12 Jyotirlingas of Lord Shiva worshipped across India it is a divine site. Feel the spiritual bliss in the air. The temple architecture is truly fascinating and promise an experience not forgotten easily. After a visit to the temple, drive towards Nashik. On reaching, check in at the Nasik Hotel for overnight stay. Early in the morning, drive towards Trimbakeshwar temple. Dedicated to Lord Shiva, the temple is a shrine of one of the holy 12 Jyotirlingas in India. After darshan return back to the hotel. Have your breakfast and leave for Mumbai. Later, get assisted drop at the Mumbai airport for your onward journey to Indore. On arrival, proceed with journey by road to Ujjain. After you reach, check in at the hotel. Overnight stay at Ujjain. 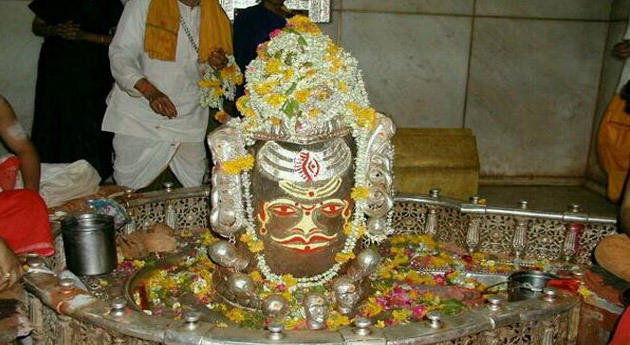 Today early in the morning, visit the next revered Jyotirlingas of Lord Shiva, Mahakaleshwar Jyotirlinga. To witness the spectacular Bhashma Aarti, one needs to visit the temple at 3 AM. Have darshan at the revered Mahakaleshwar Jyotirlinga. Take blessings of the Lord. Later, proceed by road to Omkareshwar. Located around 4 hours away from Ujjain, it is another one of the holy temples of the Jyotirlingas in India. Settled on the banks of River Narmada, the town is in the holy shape of 'Om'. Upon arrival, check-in at hotel. Later, proceed for darshan of the Omkareshwar Jyotirlinga. Do not miss to attend the Aarti ceremony. With blessings of the Almighty, get back to the hotel for overnight stay. Start the day before the sun rises to attend the early morning abhishekam ceremony at Omkareshwar Jyotirlinga. After attending the holy ritual, get back to the hotel to enjoy a delicious breakfast. Later, pack your bags and checkout from hotel. Begin with your drive to Indore. Get assistance with transfer to Indore airport. From here, aboard the flight to Delhi with holy blessings of the seven Jyotirlinga.